This is Sandra’s Four Patch Charm quilt and this is probably the only time it will be pictured in the snow as Sandra lives in Florida! 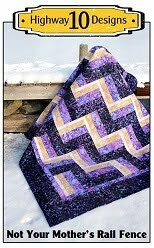 She asked that it be quilted just like the one I did in my tutorial so that was fun to do again. I think I did a better job this time as I knew what I was doing, when quilting mine I didn’t really have a plan! 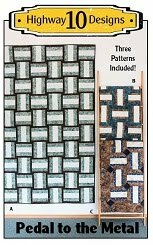 I used Quilters Dream Blend batting and two shades of So Fine, a cream for the pebble and swirls and a gold for the darker prints. Sandra used three charm packs she had for ages and the background is leftover backing from another project. 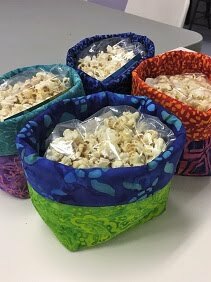 This project is a great one for stash busting! The sun is finally out after a few days of snow. But that also means cold temperatures are back but nothing to complain about, this has definitely been a mild January for us. This is Ulrike’s stunning New York Beauty quilt and she said it took her 10 years to complete this top! It is made with all batik fabrics and batik backing. The blocks and border were all paper pieced and I love the blocks put on an angle creating stars in the sashing. The whole quilt is stitched in the ditch which took the most work and then I rolled it back and added the quilting designs. I did the same feather in the outer curve in all the blocks, added pebbles to some of the arcs and loops to others. It took me a while to figure out what to quilt in the sashing but finally came up with the petal curl design the fit in the space nicely. I have lots of pictures to share! The batting is Quilters Dream Blend and the threads are So Fine. When I posted a picture of the quilt top last week I had a lot of questions about stitch in the ditch and what threads so here is what I used. So Fine #456 is the magic gray green that I used on all the blocks, it blended very well with all the colors. I matched thread with the two purples in the sashing for that design element as I wanted the thread to blend in on the sashing. I also used a light beige for SID around the outer border spikes. When I stitch in the ditch I don’t always stitch in the ditch side. Depending on the thread I’m using and the final look I’m going for I sometimes will stitch on the high side of the ditch to keep the thread in the same color fabric as the thread. I did this in the outer border in the light beige fabrics as I wanted the colour spikes to really pop! But in the blocks themselves I just stitched on the low side of the ditch as I was quilting across so many colors it didn’t matter what color of fabric I was stitching in. Here is a better look at the thread I used. There were a few spots on the blocks where I switched to the light beige thread as the blocks had a very light background. And in these blocks I stitch on the high and low side so I stayed in the light fabric like I did in the outer border. So for me there is no hard fast rule about stitching in the ditch, I do what looks right to my eye. Also in this next picture you can see where I strayed from the side I was on and stitched in the darker colour, this happens and I don’t panic about it because when you look at the quilt as a whole you never see that! There were only a few times on this quilt where I was not happy with my stitching and picked out a line or two. So don’t stress too much when your stitching in the ditch, just take your time and don’t be over critical of it. In January I like to treat myself and have my past year of blog posts printed out in book form. I use a company called Blog2Print and am always happy with the quality of the book they produce. I have been blogging for 6 years now so this is my 6th book. The first one was 70 pages and this one is 257 pages so it is getting progressively more expense as they charge per page. I look at this a piece of mind as I put so much effort into my blog that if something should happen and I lose all my posts I will at least have a copy of all the quilts I have worked on over the years. I have finished my clients New York Beauty quilt, just waiting for a sunny day to take pictures outside. This is Eileen’s Turning Twenty quilt and she used Black and White print fabrics from her stash to make this quilt. Since the blocks are such a large scale I like to use large scale panto so chose Popcorn. The thread is white So Fine and the batting is Quilters Dream Blend. We had a bit of a warm spell for a few day with above freezing temperatures. I would prefer it if it didn’t get this warm in January and it even rained last night so now the roads are slippery! Strange to hear rain at night in January and would rather it snow as that is easier to deal with than ice! I took these picture before the warm temps arrived. I am almost finished the NYB quilt and will share that soon. 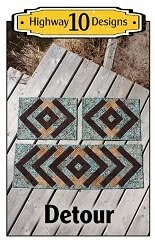 This weekend I wanted to finish up some place mats for my table. 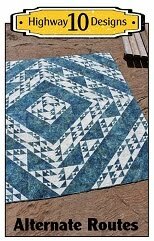 My original plan was to use this Blueberry Bali Pop to make place mats using a Judy Niemeyer pattern called Cappuccino but realized after making one block that I had no patience for that pattern. Since all the fabrics were already cut into 2 1/2” x14” strips I just sewed nine together to make a mat and made six mats in total. I quilted them with my favourite design from the Pajama Quilter called Dwirlling. 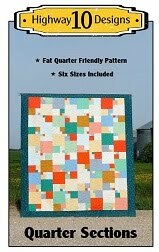 It is a super easy and fast quilting design that looks really good, I highly recommend her DVDs. Once I had the place mats done I thought it would be a good idea to do some practicing! One design that I don’t feel I really have in my head yet is McTavishing. I think it is absolutely beautiful but I have never been asked to do it on a quilt so I thought I would give it a go so I’m ready for the day that request comes in! It’s good to be prepared. McTavishing is like handwriting, every longarmer’s looks different and I had no idea what I was doing so I just went for it! I started by trying the more traditional McTavishing but kept adding the shell shape into it. Then I tried doing it around large swirls and I really like how that turned out. Basically a mix of swirls and shells with a lot of echoing, I like the texture it creates. I just loaded a beautiful New York Beauty quilt on my machine and it will probably take me all week or more to get that one done as there is a lot of ditch stitching to do. Here is a peek at the quilt top. This is Heather’s Fancy Fox quilt and it is a pattern by Elizabeth Hartman. She ask for it to be quilted flat and I was shown a picture of one done with wood grain quilting so that is what I did. I found the source of the picture, which was from the Red Red Completely Red blog which you can see here. I don’t know the name of the fabric line used but know it was a kit she bought at Fabriculous in Swan River, MB. I just quilted a slightly wavy line down the quilt and added the a wood knot to the lines randomly. I loaded the quilt sideways on my machine so the quilting process was very quick! I used a variegated grey Lava thread and Quilters Dream Blend batting. This is Lorna’s Nine Patch baby quilt and she used small cat print panels for setting blocks. I kept the quilting light as the fabrics were bold and the backing was flannel so that keeps the quilt soft. I used black So Fine thread in the outer border and just quilted piano keys in the black so the quilting does not compete with the bold stripe print. I used a bright Rainbow thread for the CC’s in the Nine Patches and black thread to stitch simple frames around the cat blocks. This is Myrna’s Mahjongg quilt that she made at our guilds Beginner workshop this summer. One of our guild members donated these fabrics to the guild so we could make a kit for our class with them and when she saw the top finished she was in fun kicking herself for giving that fabric away! I’m sure we have all done that, not seen the potential in some fabric so we give it away and then love the final quilt that is made with it! But knowing the fabric was made into a quilt and will be used and loved makes it all worth it as I have done this a few times myself! The pantographs used is called Plush, the batting is Quilters Dream Puff, thread is white So Fine and the backing is a white Minkie with a raised star design. This week I also finished a fun flannel quilt for Donna and she said this will be a quilt for her grandkids when they go camping with them in their trailer in the summers. I love how she used a simple nine patch block and highlighted the fun scrappy flannels with solid flannels. Quilters Dream Blend batting, the panto is called Fascination and the thread is a blue So Fine.